The annual Merchant Navy Day service was held in Liverpool Parish Church on 3rd Sept 2017, this was followed by the procession over to the Pier Head to the Merchant Navy Memorial where a short ceremony took place and wreaths were laid. John Farrell 49/50 laid the IOBA wreath on behalf of all and past Indefatigable Cadets & School Staff. John Aspinall 59/60 was the IOBA Standard Bearer. 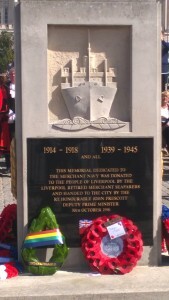 Wreaths were laid by, among others, the Indefatigable Old Boys Association (IOBA), Merchant Navy veterans, High Commissioners and naval attaches from many countries linked with the Port of Liverpool, including the Royal Navy, Canadian Navy & Australian Navy. VIPs included: Among the civic dignitaries attending was the Lord Mayor of Liverpool, Cllr Malcolm Kennedy, The Rt Revd Paul Bayes, Bishop of Liverpool & The Lord Lieutenant of Merseyside, Dame Lorna Muirhead DCVO DBE. IOBA members on the day were; Pamela Brown MBE MStJ JP DL MNM (Honorary IOBA Member), Pat Moran (Honorary IOBA Member), John Farrell 49/50, Russell Jones 55/56, John Aspinall 59/60 & Val Aspinall, Marc Hardman 1961, Tom Keyes 63/64 & Steve Humphries 75/76. Represented on the day: Liverpool Retired Merchant Seafarers, Vindicatrix Association, Merchant Navy Association(Wirral), Blue Funnel Association, Friends of Conway, Indefatigable OBA, Anchorage Club, War Widows of Great Britain, Liverpool Seafarers Centre, Nautilus, Mariners Park, Derbyshire Families Association, Sailors Society, Merseyside Master Mariners, Port Sunlight Sea Dogs, Sea Cadet Units TS Conway, TS Starling and Maritime Cadets & Liverpool Welsh Choral.